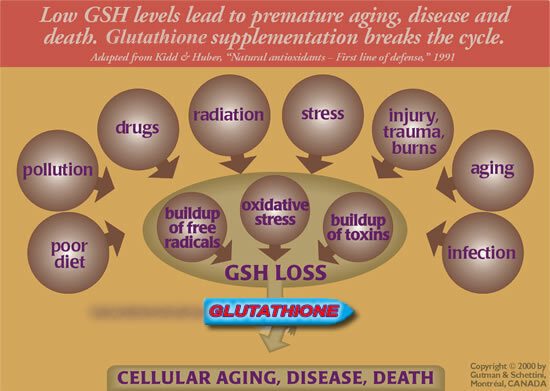 GSH - "The Natural Drug"
What is Glutathione? Why is it critical to your health? 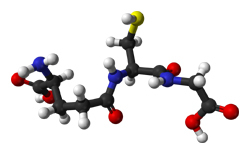 Glutathione is a tri-peptide, a small protein composed of the amino acids cysteine, glycine and glutamate. It is made in every cell of the body. It is a Major Antioxidant, produced by the cell, which neutralizes free radicals, and recycles other antioxidants such as vitamins C and E.
It is the body's Most Effective Detoxifier, binding to undesirable toxins, pollutants, cancer-causing chemicals, heavy metals, and drug metabolites and excreting them through the urine or the gut. It Modulates the Immune Response by increasing its effectiveness when it is low and bringing it back into balance when it is overactive. It assists in the Regulation of the Cell's Vital Functions, such as the synthesis and repair of DNA, the synthesis of proteins, and the activation and regulation of enzymes. It enhances energy, muscular strength and endurance. It effectively and comprehensively helps to slow the Aging process. Without an adequate supply of glutathione your immune system will not function effectively, which eventually leads to common illnesses and even degenerative diseases. The body’s own supply of Glutathione is rapidly consumed on a daily basis. 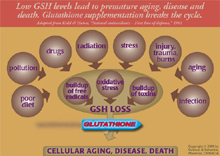 Click to enlarge the diagram on the right to see what depletes your glutathione and how it can cause disease. After two decades of research, Dr. Gustavo Bounous, a distinguished Canadian Researcher, Surgeon and Immunologist from McGill Univ., discovered the mechanism for raising Glutathione naturally, and without drugs. His research animals lived 30- 50% longer, and were less vulnerable to cancer and other diseases when fed a special protein containing high levels of cysteine. Dr. Bounous, in collaboration with Dr. Patricia Kongshavn, proceeded to develop a nutraceutical called Immunocal™. Immunocal™ delivers the “building blocks” every cell requires to stimulate the production of glutathione. Immunocal™ has been proven to sustain and significantly increase intracellular glutathione. It is safe for all ages and for pets. Click link on left sidebar for Immunocal’s listing in the U.S. Physician’s Desk Reference and Canadian CPS. Immunocal™ is very similar in composition to mother's milk, with high amounts of Alpha Lactalbumin, Lactoferrin, and Serum Albumin. In fact, Immunocal™ can provide the Immune-enhancing benefits of mother’s milk to the entire population! Immunocal™ is certified free of antibiotics, pesticides, and hormones. It is pure milk derived from cows that are free-roaming and grass-fed. The raw milk is cold-pasteurized, and bio-filtered, then made into a highly-concentrated powder, and packaged into individual packets to retain the bioactivity of the proteins. Immunocal™ is lactose-free, fat-free, casein-free and cholesterol-free. It has none of the undesirable aspects associated with cow's milk. Dr. Luc Montagnier, Nobel Prize Recipient for Medicine, 2008. Dr. Wulf Droge, world-renowned Anti-Aging Research Scientist, Cancer Researcher, Professor of Immunology and Cell Biology, has recently developed an enhanced, anti-aging formulation of Immunocal™ called Immunocal Platinum™. Immunocal Platinum™ is designed specifically for individuals 45 years and older, as well as professional or serious athletes, and for those with chronic health challenges. Immunocal Platinum™ has a method-of-use patent for the Amelioration of Oxidative Stress (the underlying cause of aging and disease). See sidebar on left for link to published articles in the medical literature by Dr.Wulf Droge, as well as the PATENTS awarded to Immunocal™ and Immunocal Platinum™. DISCLAIMER: All statements on this site have not been approved by the FDA. We make no medical claims regarding our supplements. Our nutritional supplements are not intended to treat or cure any disease.